Trades Directories of 1896, 1902 and 1914 list Amy’s husband as Farmer and Miller. I presume he had someone helping him in the mill as the cottage adjoining the mill wasn’t occupied by the family. Tithe maps tell me that a farmer of the same surname was farming the land as early as 1832. I’ve recently acquired a few postcards mainly from the early part of the twentieth century, partly with the intention of triggering memories. This idyllic view was posted in 1938. The farm is on the right hand side of the picture and the mill in the centre. The swimming pool was in the flat land at the left hand side and early OS maps show the river diverted into the area the pool later occupied to create a mill race by the mill. The next postcard was posted in 1911. Real life: a working day. I love the washing hanging outside and the drifting smoke. The photo would have been taken from Amy and Richard’s fields, with the orchard at the back of the photographer. I’ve seen pre-WW1 photos of the Cheshire Yeomanry cantering along this road and I believe they used to use the mill in some way, but so far I haven’t corroborated the connection. Please don’t download these pictures without asking me. I had to pay for them. I’m happy to share high res scans on request. I remember going to that swimming pool. I don’t support anyone has any pictures of it? No , but I’ve been searching for evidence of it’s existence for ages. Began to think I’d imagined it as evidence of it’s existence is really scant. I used to walk to it from Wythenshawe, but would love to know the actual route I took. Have tried to find it by car but to no avail. Think I used to go over fields from Selstead Road, Minsterley Parade across one of the airport roads. Would love to know where it was actually located. I remember it well, we use to cut across the flelds from Woodhouse Park, my older brother took me so I too have not been able to trace the route. Happy days though. The pool was at the left hand side of the River Bollin in the first picture down. Old OS maps clearly show the location of the pool and I imagine they would show the route you took. The mill has been replaced by a more modern building next to the bridge over the river. I can give exact details if needed. I think I have found the location of the swimming pool on google maps. If you search for Castle Hill Farm, Ashley, then look directly NE in the direction of the Bollin, there is a strange shape in the field adjacent to the river. It appears vaguely horseshoe shaped with a distinct curve at the eastern end. I think this marks the area where the river was diverted to form the pool. What do you think? Is this the location? You’ll see the lane forming a general arrow shape with Castle Mill at the tip and Castle House Farm to its right. The Bollin loops under that arrow and south of the river, almost directly south of the farm, is the semi-circular swimming pool. It’s accessed by a rough path from the lane, just south of Castle Mill Bridge over the Bollin and there’s a paddling pool marked before the main pool. There are also tennis courts shown. This shows that the pool was definitely there before 1935, as maps are planned before the date of publication ands this confirms accounts by elderly relatives of mine who recall going to the pool in the 1930s. Others remember it in the 1940s and 1950s. The swimming pool is not shown on the 1910 maps but there is a small wide loop in the Bollin just before a weir which took it back to the mill race. I don’t know when the pool was constructed. You can see the swimming pool very clearly in the 1969-1971 1:2500 Post WW2 Cheshire map from the menu at the side. This is a fantastic site which I use a lot as a resource for for local history stuff. We had some family who lived in the area going back 2 generations. I am seeing them over Christmas and will report back. Wow – yes that was brilliant information thanks. All i need to try and find now is a picture or two! It’s actually very interesting looking at that part of the Bollin vs the OS maps – there are two Oxbows which have formed downstream of the Swimming pool! If anyone can turn up some pictures, please let me know. I might pop by the actual house and see if they can help! Maybe try Trafford Lifetimes http://www.trafford.gov.uk/content/tca . Searching on “Castle Mill” gives a few more postcards, though none of the swimming pool. I haven’t tried other search terms. They might have pictures in storage. If you do pop by the house, I’d like to know whether the inset plaque on its gable is the one from the original mill. I haven’t stopped to peer in case they think I’m dodgy! Searching on “Cheshire Yeomanry” gives two pictures of the Cheshire Yeomanry cantering down the lane with the mill in the background. Undated unfortunately. I feel pretty sure that the swimming pool closed after someone drowned. I always thought it was murky as well as perishing cold. If I’m wrong about the death I’ll edit my comment. Thanks for all the really useful replies & the renewed interest. Have tried to access the old maps website but it keeps saying they are not available – do you have to pay to get proper access? Am going to try Dave’s suggestion on Google maps. Perhaps we need to do a planned to the visit to the house on masse so we don’t look too weird! We lived in Hale and our neighbours went to Colwyn Bay on holiday; for about 10 years as a child I thought that the swimming pool WAS Colywn Bay. This was in the ’70s and I think I remember the pool area being blue, like a proper lido but was that just in my imagination? No, you’re not imagining it, though by the time we used it as children the blue was a bit murky! I remember going to Cassie as we used to call it with a bottle of corporation pop 🙂 from Woodhouse Park and we used to run across fields to get there. I have a couple of pictures from mid 1950’s of us in the river and picnicing on the grass. Remember the pool anf going there later as a tennager in the 60’s. I have lived in Canada since 1972 and was just thinking about this spot so got on Google. How do I post my pics here?????? Hi Jeff. Not sure how you post pictures – I’m sure one of the regulars can help you there. I would absolutely love to see a picture of the old swimming pool as I just cannot remember what it looked like. Me email is david.jones@talktalk.net if you have one. Many thanks. Dave. Jeff has sent me three photos. I will download them, host them and add a link. Bear with me. Yes I as a child and lots of local friends from woodhouse park spent all our school holidays at cassie we crossed fields past the airport and pasted the Romper pub and we didn’t use the Pool we all swam in the Bollin with the leaches we had lots of happy times there brought jam butties and bottles of water and knocked on a few houses on the way to fill our empty bottles and the weather was always nice and sunny oh I miss them care free days what wonderful childhood memories we have, such a shame our children and grandchildren don’t have the freedom that we had. happy days. Such a shame that those carefree days of summer are now replaced with parents dropping kids off everywhere in huge 4×4’s and no ability for kids to roam/explore/climb trees/swim in rivers without some jobsworth or paranoid parent worried that little jonny will come to harm. Honestly believe that not much has changed between then and now – other than the levels of paranoia, increased traffic (a legitimate concern) and general media hysteria. I never imagined that my little postcards would have invited such attention and international at that! Thank you. I think only blog owners or designated users can post photos in a blog reply. You can put them on a hosting site (eg flickr) and post a link. It might be possible to link to an image on Facebook (I’ve not tried this) or you can tweet the photo and provide a URL to the tweet. You have my email address so if you were to email me I could send you my pictures of my sister and friends playing in the river and picnicking on the high banks with my parents with a square church steeple in the background. If you know the name of the church I would appreciate it. I would be about 5 or 6 in these photos so the date would have been likely 1952 or 53.
fascinating read, I now live on Castle Mill Lane, and I was wondering if you could email me, would you be willing to share some high res scans of your postcards? thank you. Of course. What for? If they’re used for anything other than personal interest I would appreciate an acknowledgement, please. You can’t embed images in replies. I’ve put Jeffrey’s three photos on my flickr – at the moment they are the first three in the photostream. http://www.flickr.com/photos/mightygwyn/ EDIT: I have temporarily removed the link to the images after external changes to the way flickr operates. .
I’m confident that the middle picture wasn’t taken at Castle Mill, because there isn’t a church resembling that. However, you could swim and paddle in various spots along the Bollin (the river which goes through Castle Mill). Edit. I suspect it’s St Bartholomew’s, Wilmslow. The three pictures linked to are © Jeffrey Cottam. HI, I have been really interested in reading the post’s, my father has recently gone into a care home suffering from dementia and I always knew he was working in the area during the ww2 (1943ish) on a farm, and one day recently he came out with the name of the farm it was Castle Hill Farm, which was or maybe still is a dairy farm, he even calls some of his carer’s after the cow’s which he looked after ie; snowdrop, buttercup etc, strange what the mind comes out with!, his name is Kenneth 85yrs,he has been very secretive about his past, can anyone help with my research? maybe the names of the farm owners during the war. many thanks………..Michael……. Hi Michael. The farm in my pictures is Castle Mill Farm (Mill Lane). Confusingly there are two Castle Hill Farms close by. One is further along Mill Lane to the east, near the Wilmslow Road. This is spelled Castlehill Farm on old maps of 1877 and onwards. The other is south: Mill Lane -> Castle Mill Lane (off to the right). This one seems to begin to appear on old maps at the end of the 19c and by 1909 it is also called Castlehill Farm. I can try to ask about names, but it means finding someone who knew either of those farms. Michael, does the surname Percival ring any bells? Thanks Chris for your reply to my request, I will mention Bill Blockley’s name to my father, what was Bill’s wife’s name, or do you have any other info? what sort of farming did they do? I wonder if anyone might be able to find some photos of the old pool? I just can’t quite remember what it looked like! In reply to the comment from Dave Jones, I have photos of the pool, in its heyday, but don’t know how to submit them. Hi, the picture of the water looks like what was known as the beach at the river Bollin, this was at the Carrs field in Wilmslow , in the 1970s part of. the graveyard was washed into the Bollin and some of what was left of the coffins were washed up on the beach. I lived in Wythenshawe in the 1950s my older brother used to go swimming at Castle mill pool, i heard it was closed quite a few years later as it became infested with leaches and blue green algae. There is a horse shoe shape on Google maps at the location but i think it is part of a horse training ground. I will ask my brother if he has any pics of the pool. 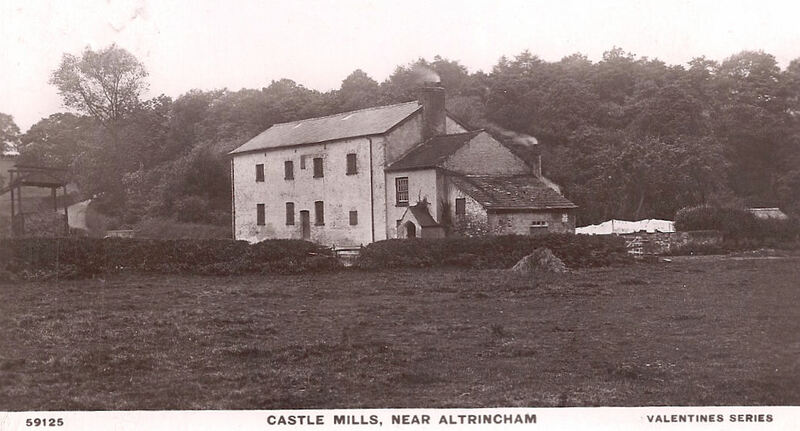 I remember going tocastle mill inthe early 50 s from Sale Moor. We would walk up Booklands road. Then up Brooks Drive. This took us to Hale rd.Proseed left toward whilmslow turn right after the Romper pub into the mill and the pool.I was glad when I put together an a/s/p bike.It was a long journey.Sadly Brooks Iane is built upon now, and the airport has swallowed the old roads. I cycled to Castle Mill Pool, from Hale Barnes, as a teenager in 1975 (give or take a year or so ). The pool was open to the public and cannot remember if there was a fee. It was tiled and very popular, but with freezing cold water.I cannot even recall how I discovered it or was introduced to it. I’d love to see any photos cos it has happy memories for me. Went to Castle Mills many times when I was young & have been back a couple of times with my dog Dusty, a border collie with sky blue eyes, sadly he passed away last year. One of my visits of recent past was to find the Bird Sanctuary of which I now have pictures past & present & if I remember rightly, I passed through the woods on a few occasions on my way to the river. One year, when I was about 12, a group of us went to the Bollin, across the bridge where we used to sit but, this time it was winter & there was about 2 foot of snow on the ground. One of the lads (Keith), dared us to go skinny dipping, his brother took the dare on, so we built a fire up against a big oak tree on the left as you get the other side of the bridge, the charred tree is still there to this day. Kevin went in, it looked freezing & Kevin then dared us all to go in, with courage from somewhere, we all jumped in, naked as the day we were born, screams, howls & laughter had by all & a great fire to keep warm when we got out, a day I will always remember all my life. We once went in the outdoor pool, where the tennis courts are situated now but, we did not pay the shilling to get in, we went around into the woods & climbed the fence. We never went in the pool again, it was more fun at the river where the bridge was, it once being a rope bridge with lats to walk on, we used to swing it when the girls got on & they screamed, it was so funny to us then. Castle Hill Pool went through several incarnations. It began life as a mill race, diverted from the Bollin, past the front of the mill and around to the side, where it was dammed to provide a head of water to drive the big, wooden, undershot water wheel which drove the mill. Later, when the mill had ceased operating, the dam area was developed into the big, semi-circular pool, with adjacent rectangular paddling pool, which most people remember. Later still, the area was landscaped into a luxurious garden for the mill, which had become a private house. The big pools and changing rooms were much reduced in size, leaving a smaller, neater, kidney shaped pool. The public were still allowed in and yes, the all concrete pool had the surrounds painted white, while the plunge sides and bottom were a light blue. No longer fed from the river, it was kept very clean, by a filtration system, and surrounded by well kept lawns on which to sunbathe. Eventually, this pool, too, was filled in and the area grassed over. The final chapter began when the property came into the ownership of Dougie Flood and family who built the present, Spanish style, villa opposite the old mill, and had the original building demolished. Thank you, Stuart, for that detailed and interesting contribution. I’m sorry for the delay in replying: I was away. I don’t think you can upload a photo directly to a reply, but I can add them to the original post. Obviously I would credit them properly. If you would like to do that, I can send an email to the address which accompanies your post and you could reply with the photo(s). Alternatively you could upload them on to a photo hosting site (eg flickr). Then either use the IMG button which appears above the ‘Add new comment’ box to bring up a dialogue box in which you paste the photo’s URL, which will make the photo appear in your post; or post a link. Hi again guys. Stewart, I would love to see the old pictures of the pool so much. I have tried so many times searching for it on Google. Actually it’s Gwyn! 🙂 It’s kind of you to offer to upload to flickr. Ok Guys, here we go – hopefully this will work. It’s a link to my photobucket site which should contain the three photos of the swimming pool that Stuart kindly sent me. Please let me know if it doesn’t work. Does anyone know of history further of the mill ? My relations used to be the millers in the 1700s and took it over from the Davenports ? I spent most of the summer of 1971 doing a college dissertation on the stretch of the River Bollin below Castle Mill. I have a couple of good aerial photographs of the area clearly showing the swimming pool though one does look very like the first photo on Dave Jones’ page. I could scan and email these photos to anyone who might be interested. Incidentally, I postulated that the abandoned meanders/ox-bow lakes could well be due to the incision by the Bollin into its flood plain following the construction of the Manchester Ship Canal into which the Bollin flows. The theory is/was that rivers do abandon meanders when cutting down. My idea was that the Bollin would have needed to cut down to the new level of the Ship canal. It could well be rubbish but it got me a good mark. Is it still possible to walk along the Bollin below the bridge as I would love to go back and see how the river course has changed. We drove past yesterday but there didn’t seem to be anywhere to park and we hadn’t a lot of time anyway. After visiting the Castle Mill area a number of times as a youngster I spent most of the summer of 1971 there doing my college dissertation on the river. I used some aerial photographs from Airviews of Manchester airport which I’ve still got (one of them looks very like the extract on Dave Jones’ photobucket site (see above) but I do have others. I also took a lot of photos of the river at that time. Incidentally I postulated that the abandoned meanders could well have been caused by the deepening of the river Mersey. This would have happened when the Manchester Ship Canal was created for near Lymm the Mersey and ship canal are one and the same for a short distance. This happens to be where the Bollin enters. It was an accepted idea back then that when rivers incise into their flood plains they tend to abandon meanders (all to do with the energy available). It sounded a plausible idea at the time and it got me a good mark so who cares! I found your site after researching Castle Mill because I went there last week intending to walk along the river to see how it had changed. However we hadn’t a lot of time and couldn’t see anywhere obvious to park. Can you still access the riverside there? Hi Brian. That’s really interesting! If you would like me to add the photos to the photobucket site, I would be happy to do this? My email is available through Glyn. Hi all, Brian Wood has sent me some more photos and information about the Bollin River around Castle Mill. I’ve made a diagram on the modern day Google earth image which shows the approximate position of where the swimming pools used to be. They might have been slightly further back from the river than I have drawn, however, the orientation is pretty much correct. Interesting to note from the old pictures, there was an entrance to the swimming pool immediately on the left after crossing the bridge by the old mill. Evidently there was a small car park there and I think the original tree still exists in that place. Many thanks to Brian for sending me the pics and if you have any issues accessing them, please let me know. I went to Castle mills in the 70s all the local kids went there in the school holidays we walked through lots of fields at the side of the airport passing by the Romper we had packed lunch i.e jam butties and corporation pop and knocked on a few cottages on the way to fill our empty bottles with water, we never went in the swimming pool unless we sneaked in, we swam in the Bollin with the leaches, we had so much fun as children we were so carefree just a shame our grandchildren cant have the same childhood. Happy Days, we walked from woodhouse park. Wow such fabulous memories, lots of us from Wythenshawe use to go here lots in the summer time, and the River Bollin! Loved it, I remember the pool at Castle Mills being very blue, freezing cold, but I stabbed my toe once because the floor on the bottom of the pool would slope down at the shallow end…. That ladt comment reminds me of the time we would say “let’s run to Cassie! !” and we would take to the fields from Woodhouse Park past Ringway … “let’s take a bottle of corporation pop!” and we thought we had the world by the tail. Lived in Canada since 1972 but that is a good memory of the 1950’s. Is anyone able to find any other photos of the pool? Sadly, Anne, you will only be frustrated if you go looking for the pool. All signs that the pools and mill ever existed have been totally eradicated. The only way of knowing you are looking at the same site today, is when you see the awful eyesore which is the Flood’s, Spanish style villa. Apologies for the delay in approving the latest interesting contributions. I’ve been away. My book ‘Bollin Valley from Macclesfield to the Ship Canal’ has lots of information on Castle Mill and the pool, with a site map and many previously unpublished photos. I used to cycle with friends to Castle Mills open air pool with friends on hot sunny days as a kid from Bowdon Vale – down the lanes through Ashley – late 1950s, early ’60s. Water was green ! from the Bollin and pretty cold. Not uncommon to have a frog swimming alongside you. Popular place though. Years later – early 1970s, now in possession of a C-Scope metal detector, I went up to the area having heard it had long since shut down to go over the area to see what had been lost. There was a new large Villa being built on the site further up the hill in the same grounds, so I went up there and met the owner – a Jewish lady, who gave me permission to take my detector over the pool surround area. The pool had been filled in, but you could clearly see where it had been. Apart from the odd few coins, old pennies, threepenny bits, tanners, 1x florin and a couple of well rusted wristwatches ! there was nothing of any real value. Mind you, what did I expect from that era – we were all pretty skint ! 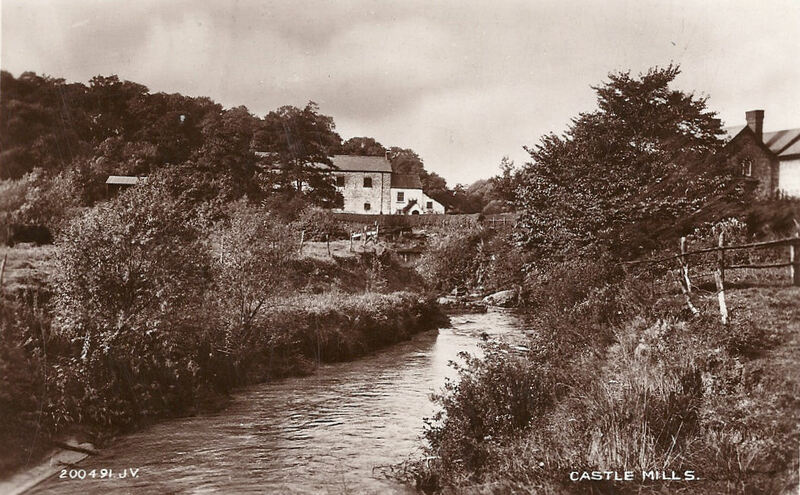 My mum and her twin brother were born in the cottage at castle mill above what was called the shippen.